One of the most common roles of an engineer in the HVAC industry is refrigerant recovery. As some refrigerants have been found to have an impact on the environment, the rule surrounding how refrigerant is dealt with have become stricter. Engineers will be keen to ensure that they’re carrying out every aspect of their role as professionally as they can. The following processes help ensure that you’re contending with refrigerant recovery in the right way while being aware of the tools needed to carry out the task. The basics of refrigerant recovery is often about common sense. Regardless of how long an engineer has been operating in the HVAC industry, they should always ensure that safety comes first. This can include wearing safety glasses and gloves and ensuring that the right types of hoses are being used. Scales should be used to ensure that the refrigerant isn’t overfilling the recovery tank, as well as ensuring that there are no exposed flames while the work is being carried out. There could be other tools and considerations to factor depending on the role being carried out. There should be a uniformed process that all engineers follow when working for a company. Those who operate independently could create their own checklist to ensure that there are no issues when dealing with refrigerant recovery. An engineer in the HVAC industry not only needs access to the right equipment, they also need to ensure that any vacuum pumps or refrigerant recovery devices being used are professional and built by a reputable manufacturer. It’s also important that engineers only purchase equipment from a company that is experienced within the industry, as this will ensure that the correct warranties are in place, and you’re being given sage advice as to what kind of equipment suits your needs best. Liquid Recovery: This allows engineers to transfer refrigerant while still in a liquid state. Although this can be the fastest way to recover refrigerant, but it’s not possible with all HVAC applications. The application will normally have to be purged to ensure that there is no cross-contamination. Vapour Recovery: Although slower than liquid recovery, the use of vapour is the most common refrigerant recovery approach within the industry. As the name suggests, the refrigerant is transferred in a vapour state. The process is like that of liquid recovery, albeit with some different setting on the refrigerant recovery unit. The Push-Pull Method: The push-pull method is a quick and effective way of recovering refrigerant, but it is a two-stage process. The first stage consists of recovering refrigerant, then changing connections to recover the vapour. This process is generally only used if there is more than 10lbs of refrigerant to contend with. Becoming familiar with the different methods used and ensuring that engineers are using the right equipment when recovering refrigerant ensures that the process is professional and safe. 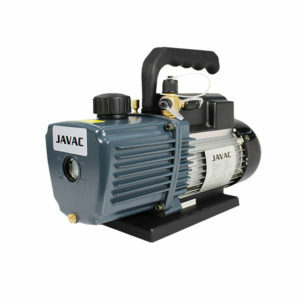 If you’re an engineer or company looking for advice as to what type of vacuum pumps and refrigerant recovery devices are best suited to you, then why not get in touch with HVACTOOLS to discuss your requirements in more detail.